Many of you were enthusiastic about the lentil soup recipe I posted a few weeks back. Today's split pea soup recipe is similar in spirit. 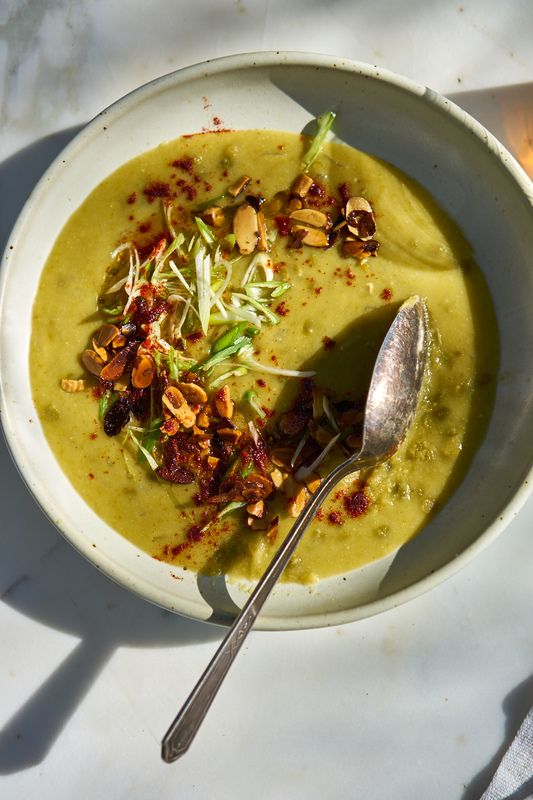 It's a delicious, healthy, textured soup made from an impossibly short list of ingredients. Seriously, just five! No ham hocks in this version, simply green split peas and onions cooked until tender, partially pureed, seasoned and flared out with toppings. 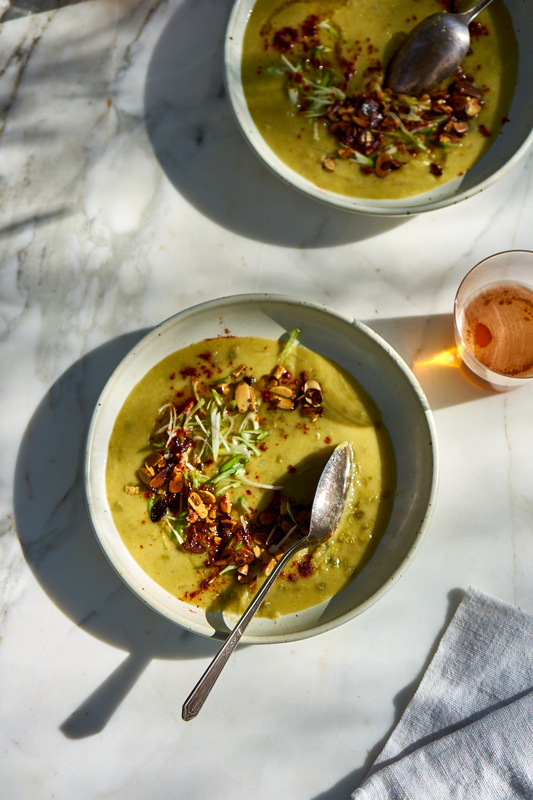 Like many lentil soups, this one delivers many of the same nutritional benefits - a good amount of vegetable protein and plenty of staying power. It is hearty and filling, and even better reheated later in the day. You can find dried split green peas in many natural foods stores, I picked these up in the bin section at Whole Foods Market. I like to finish each bowl with a generous drizzle of golden olive oil, a few flecks of lemon zest, and a dusting of smoked paprika to give the soup some smoky depth. If you have scallions or toasted nuts on hand (pictured), great! Toss some on as well. Hope you enjoy the soup, and for those of you who have never tried split peas, this might be the time to give them a go! I thought about throwing a couple handfuls of small broccoli trees into this soup (a few minutes before doing the puree), spinach would be great as well. You can use a vegetable stock if you like in place of the water, or favorite bouillon. I sometime use about half of one cube in a soup like this to kick things off - it makes a nice, light but flavorful broth. Add olive oil to a big pot over med-high heat. Stir in onions and salt and cook until the onions soften, just a minute or two. Add the split peas and water. Bring to a boil, dial down the heat, and simmer for 20 minutes, or until the peas are cooked through (but still a touch al dente). Using a large cup or mug ladle half of the soup into a bowl and set aside. Using a hand blender (or regular blender) puree the soup that is still remaining in the pot. Stir the reserved (still chunky) soup back into the puree - you should have a soup that is nicely textured. If you need to thin the soup out with more water (or stock) do so a bit at a time - there are times I need to add up to 3 1/2 cups extra. Stir in the lemon juice and taste. If the soup needs more salt (likely), add more a bit at a time until the flavor of the soup really pops.